This is the eighteenth purana I am reviewing and is a rajasika Purana. It is ninth in the list of Mahapuranas and is made of about fourteen thousand shlokas. As the name suggests, this Purana talks about the future, as bhavishyati, the Sanskrit word for ‘to be’, or ‘will happen’. This Purana has a lot of information on the future, astrological predictions and also about the medieval period and the time when the British came to India. Some puranas like the Matsya Purana, Vayu Purana and the Brahmanda Purana have borrowed their predictions from the Bhavishya Purana. As I have mentioned earlier, the Bhavishya Purana includes events that are pretty modern. Most people don’t think that such predictions were ever made. They believe that the modern events were added to the Purana in the form of predictions supposedly made by sages. There is also this confusion on what makes up this Purana, as this Purana is found in three different versions today. They are the Bhavishya Purana, the Bhavishyat Purana and the Bhavishyottara Purana. None of the three texts separately count for a Mahapurana as they do not have the five characteristics that make up for a Mahapurana. Therefore, the Bhavishya Purana is the three parts together. This Purana does not have many stories but contains many rituals and information on different fasts, different forms of dakshina and the dynasties that ruled in the Kali yuga. The Bhavishya Purana praises Lord Surya a lot. There is a lot in the purana on how to worship Lord Surya and his different devotees. This Purana is divided into five major sections which are the Brahma Parva, the Vishnu Parva or the Vaishnava Parva, the Rudra Parva or the Shiva Parva, the Tvashtra Parva or the Soura Parva and the Pratisarga Parva. There aren’t many stories, so I will mention two relatively short stories and will include some extra information that will interest you. One of my favourite stories was about a brahmana and a ghost which tells you the importance of the shukradvadashi vrata. The second story that I really liked was the story of how the Bhojakas, devotees of Lord Surya, came to be. Once a brahmana came upon a ghost who was lying on the banks of the Vetravati, a river that flows along the city of Vidisha. The sands on the banks of the river were very hot because it was summer. The ghost was covered in boils and was crying out for water. When the brahmana questioned the ghost on why he was made to suffer thus, he answered that in his earlier life he was a vaishya. The vaishya was rich but was too attached to worldly possessions and did not respect or donate any alms to brahmanas. He also didn’t worship gods and was evil. Hence, this was his punishment. The ghost asked the brahmana to help redeem him. The brahmana decided to transfer the punya he had acquired by performing the shukradvadashi vrata to the ghost. Once the ghost received the punya, he ascended straight to heaven. The Bhojakas are devotees of Surya along with the Magas. The story of the Bhojakas is as follows. Prince Priyavrata, the son of Svayambhuva Manu, had built a temple for Surya at Shakadvipa and had installed a golden idol of Surya in the temple. Priyavrata couldn’t find anyone who he thought was suitable enough to be the priests of the temple. He began to pray to Surya for a solution. Surya was pleased, so he created eight beings from his body and instructed them to be the priests of the temple. These eight beings were called the Bhojakas. 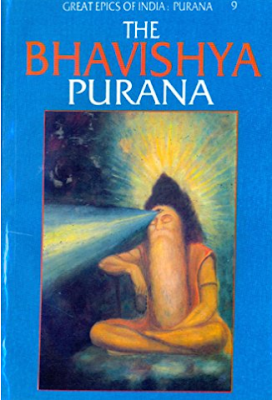 Unlike the rest of the Puranas, this Purana is not very strict on the different classes. It states that even a shudra can learn the Vedas, unlike in the other puranas where such a thing is not allowed. It lays emphasis on the fact that birth does not determine your class and that a brahmana and a shudra are the same. The common belief was that brahmanas had a white complexion, kshatriyas a red complexion, vaishyas a yellow-like complexion and shudras a black complexion. It says that complexion does not matter on caste. The author says that this information in this Purana is very important as it tells us when the class system evolved in India. It must have evolved during the arrival of the Aryans after which the different races coming to India must have reduced the distinction. The purana also shows Buddhist influences when they say that class is meaningless. I found this interesting as it is the complete opposite of what I have read in the other seventeen puranas. This Purana is absolutely fascinating after the above facts and that it records the coming of Queen Victoria makes it even more interesting. It also contains a lot of information on Lord Surya, and most of the information is new to me. The whole Purana will have much more to explore, so why not read the original or at least the abridged version?